FREE SHIPPING. 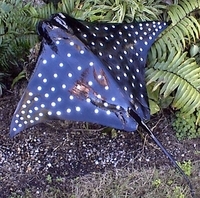 40" Spotted Eagle Ray Half Mount Fish Replica Taxidermy. This is a popular half mount replica. This half mount fiberglass stingray measures 40-inches from tip to tip. The gloss black body highlights the snow white spots to make a vivid and striking presentation. Pair it with another spotted eagle ray or one of the smaller (20-inches) to create your own style. Estimated time for shipping marine animal replicas are about 2-3 weeks.